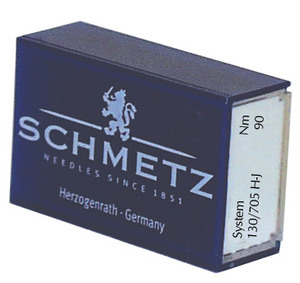 Schmetz Jean & Denim Machine Needles! Great for use with densely woven materials and jeans, and free motion quilting. It features a very stiff shaft, modified point and slender eye. It is a great choice for getting perfectly straight stitches. 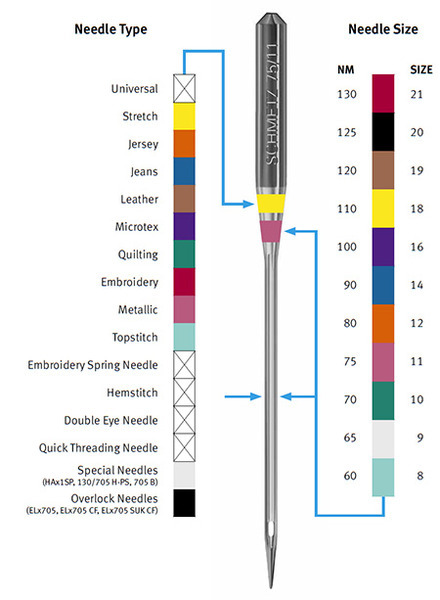 This needle features a modified medium ball point and reinforced blade. For use on denim and similar fabrics. Advanced point design is a SCHMETZ exclusive. For penetrating extra thick woven fabrics, denims, or quilts with minimum needle deflection, reduced risk of needle breakage and skipped stitches. Available in sizes 70, 80, 90, 100, 110. Designed for densely woven fabrics or free motion work. I have ordered by phone as well as internet--and your service is great--not to mention great prices!! I got my order faster than I thought I would! So glad to be able to buy sewing machine needles in quantity at a discount price. I'm sure I'll be ordering from you again.